This routine is all about layering and mixing. It makes me feel amazing and motivates me to take care of my skin every day. We don’t add scents to our products so you’re experiencing the scent of the natural ingredients. It’s these little luxuries in life that make me feel joyful - so make the most of these moments for your skin and your soul. This may seem like it takes half an hour, but don’t worry, I don’t have half an hour either! In the morning, I wake up with a clean face. I am a big proponent of exfoliation because we shed cells constantly, so I love to just polish the skin daily. 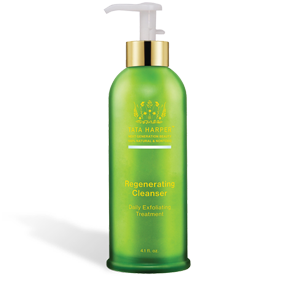 I use with Regenerating Cleanser which is gentle enough to use daily. Start on dry skin, I massage in, polish my skin, and rinse. This is where I spend the most time, exfoliation makes sure the rest of my products absorb better. 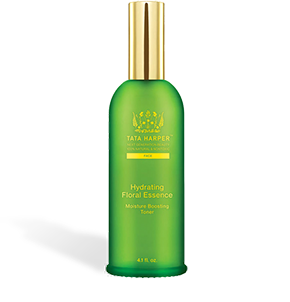 I dry my face after rinsing and saturate my skin with Hydrating Floral Essence - hydrating with hyaluronic acid and making sure my serums can soak in as much as possible. I have dry skin so this extra step of liquid hydration is a must for me. After the essence it’s important to apply the most important step with my skin still wet - serum and eye cream. 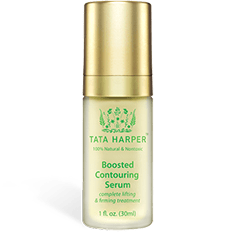 I do 2 pumps of serum - one pump of Elixir Vitae and one pump of Boosted Contouring Serum - mixing them in my palm and then applying from forehead to chest. I love cocktailing both because being in my 40s I want the plumping up and the relaxation of expression lines. I always recommend mixing based on your skin goals. 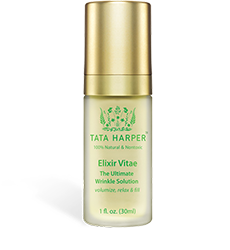 Next step is one pump of Elixir Vitae Eye Serum, and I put that all around my eye - upper lid, lower lid, temples. I then use any extra around my lips for fine lines. 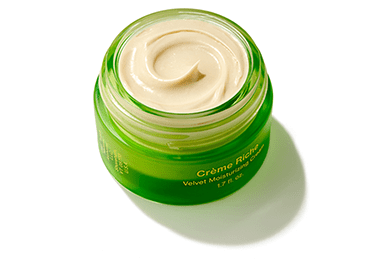 I also add the Restorative Eye Crème, because it’s so buttery it just feels like it melts the wrinkles off. I want this area of my face hydrated all day, so I put extra and let it absorb. 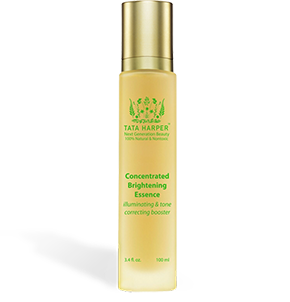 A lightweight, youth-giving face oil that targets visible signs of aging to reveal balanced, radiant looking skin. 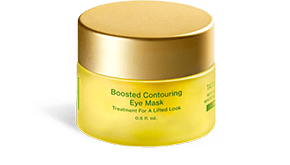 Best for fine lines & wrinkles, or uneven skin texture. 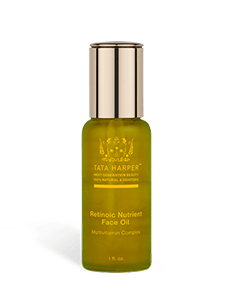 While all of this is absorbing, I add 2 pumps of Repairative Moisturizer and 2-3 drops of Retinoic Nutrient Face Oil into my hand and mix together, then apply on top of my serum from forehead to chest. I have noticed a big difference in my skin since I started double cleansing - my facialist is surprised that she has so little to extract! I love to do Nourishing Oil Cleanser in the evening because it’s amazing at removing dirt and debris from my skin - I use it from my forehead to neck on dry skin, allowing all the vitamins to sink in. 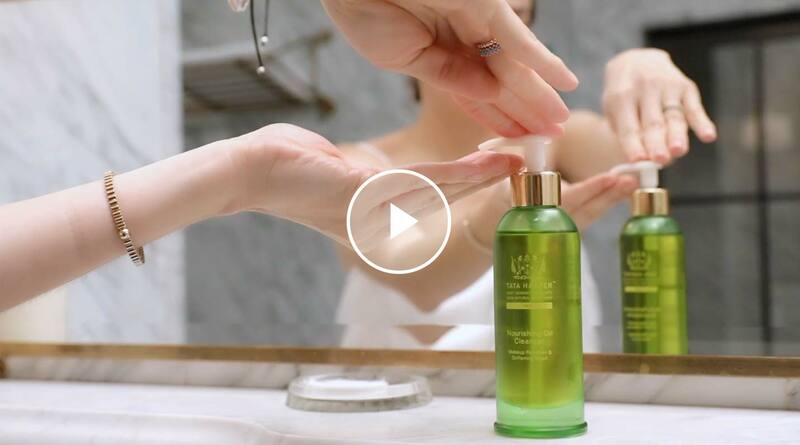 I rinse off with warm water, pat my skin dry, and follow with the Purifying Cleanser - this is my first line of defense against daily pollution. I travel so much to cities that I need to combat this invisible enemy to my skin with this cleanser. I love how it transforms from gel to oil on dry skin and then to a milky cleanser when mixed with warm water. At night, I do the Concentrated Brightening Essence. Aside from working on your glow, the BHA ingredients retexturize your skin. I saturate my skin from forehead to chest and follow with the same 2 serums from my morning routine - Elixir Vitae and Boosted Contouring Serum. If there are 2 products you should repeat from morning to night, it’s serum and eye cream. Make sure you’re doing them morning and night to get maximum results from these skincare workhorses. 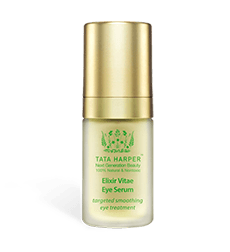 I repeat my eye routine from the morning here - Elixir Vitae Eye Serum and Restorative Eye Crème - then I top it with our Boosted Contouring Eye Mask which is a rich, whipped balm that keeps this area super hydrated. 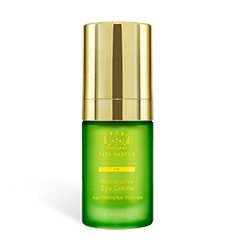 At night I add Creme Riche as the final step, mixing in a few drops of Retinoic Nutrient Face Oil.